I don't make many requests on Netgalley, but when I do I always seem to ask for that one book that is nearly impossible to get. Often my request is declined. This shouldn't be a surprise to me by now, but somehow it is. 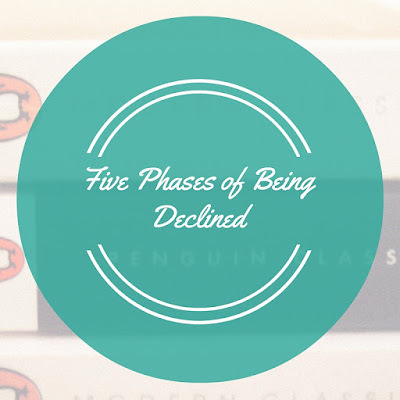 I still go through the Five Phases of Being Declined. You recently requested to view a title from NetGalley's Public Catalog. Unfortunately, the publisher has declined to allow access to the title at this time. Wait, you say. They denied ME! But I have such an awesome profile page, with stats and everything. Also, don't they know how much I wanted it? Then you think about maybe tweaking your profile and resending the request- which you do not actually do. You think about your blogging contacts. Is there someone you can pester on Twitter? Okay, maybe that's not such a good plan. Finally, you accept that you won't be reading that hot new book first. You won't be able to put it on your "Currently Reading" shelf on Goodreads months before everyone else. But then you realize you can buy it when it comes out. At least that's something, right? Haha - this is great!! And has happened to me SO many times this year! For some reason, I've gotten declined a lot more this year than last year...have no idea why that is b/c my NG feedback rating is higher this year and my blog stats are higher as well. I definitely got more nos lately. Maybe it's because so many people are requesting on there now. This happened to me with a Murakami book I wanted and I was so pissed off!!! But then, I ended up getting chosen to be an ambassador for the book which was so weird. It was much better because I got two signed copies and copies of another book to giveaway, but man, I felt like a loser when I got that initial decline. And then it happened to me again with the new Justin Cronin book. Decline Central. But then, I begged and the other day I got a copy. When I appeal, I get the book about 50% of the time so I nearly always try again. I am not against begging if it involves any of these authors: King, O'Nan, Cronin, Murakami, Van Booy. Oh wow, ambassador is so much better! I was declined for the Cronin book too, which is why I wrote this. It's weird because I was sent the first two. Maybe I need to beg. Strong hints don't seem to be working. Van Booy is another I will stalk my Twitter for. Mmm, so true! But at least once you're declined, you KNOW. I requested Blue Lily Lily Blue on Netgalley last year, and the publicist took, oh I don't know, FOREVER, to make a decision about whether I could or couldn't have it, and the waiting was a killer. I WAITED LIKE A MONTH. Ugh, that is torture! If I haven't heard in a couple of weeks, I assume I'm never going to hear from them ever. That happened to me with a Shirley Jackson book. I just never heard from them for like a year- until my request disappeared. Haha lol, yeah, I go through most of these when I get declined a book. I even go through a phase of trying to figure out how I can improve my review percentage, etc - a number that NetGalley loves to display on my profile, thereby reminding me how bad I am with reviewing their egalleys. Oh well. haha, this is great! I hardly ever use Netgalley any more because I hardly ever post reviews, but definitely felt this way in the past! Haha..so I am not the only one. Yes. I know all of this well.